For most freshmen, entering your first year of college means gaining a lot of freedom. That freedom can be a lot of fun, but it can also do some damage to your grades. Here are three helpful hints to help keep you on track so you can enjoy your newfound freedom with a little less stress. 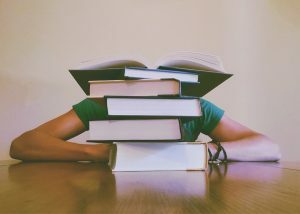 Avoid being overwhelmed by last-minute studying! Try to take classes that actually interest you. While it’s very important to make sure you’re filling your requirements, try to utilize the search functions in the course guide and try to find classes that fill requirements and also sound like you’d enjoy them. It isn’t always possible, but it’s much easier to study if you’re interested in what you’re learning about. At least attempt to do the readings. You’re responsible for your own learning in college, so no one is looking over your shoulder to make sure you’re keeping up. Many professors don’t have reading checks in class, so it can be easy to fall behind. It may not seem necessary to keep up with weekly readings at first, but you’ll be thankful when the midterm rolls around. Stay organized. There’s a lot going on in college. Find a way to keep track of assignments, papers, and exams, as well as your work schedule and student org meetings to make sure that you have enough time to get all of your work done. This can also help make sure that you don’t miss anything important.